French Jews are fleeing parts of the Paris suburbs to escape anti-Semitic hostility, the levels of which have not been seen since World War Two, reports the Paris newspaper 20 Minutes. “When the nationalist wolf puts on a blue sheep skin it does not change its nature, only its appearance,” said Oskar Deutsch, head of Austria’s main Jewish association, in an open letter on Facebook to both centrist parties. “If OVP and SPO believe they can tame the wolf, they are deceiving themselves,” Deutsch said. Founded by former Nazis six decades ago, the Freedom Party long ago left the political fringes to establish itself as a mainstream party. Strache insists that antisemites have no place in today’s FPO, which routinely has to expel members who step over the line. He has visited the Yad Vashem Holocaust memorial in Jerusalem and has called antisemitism a crime. “[The FPO] make scapegoats of people who think and look differently,” Deutsch said, adding that “almost daily” there were racist and antisemitic incidents. 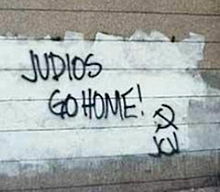 Antisemitism and threats against Jewish facilities are wrong. My wife and I attended Worldwide Church of God services in a Jewish Community Center in Long Beach, California for a number of years. At least once it was hit by anti-Semitic graffiti during the time we attended. Many Jews are targeted simply because of their ethnicity. And like Adolf Hitler demonstrated, it is not just Islamic leaders that can have antisemitic traits. European leaders and their predecessors in the Roman Empire who claimed Christianity have long promoted antisemitism. The way that Jesus, who was Jewish, taught differently was love. Jesus never taught to have ‘nothing in common with the detestable Jewish crowd.’ Roman Catholics refer to Constantine as ‘Constantine the Great,’ but he obviously held anti-semitic views. Around 332, Constantine issued what is known as the Edict Against the Heretics which included persecution against Christians who held to the original faith and had practices, such as the date of Passover, the same as the Jews (see also Persecutions by Church and State). John Chrysostom is considered to be a major Roman Catholic saint. He is one of the four ‘doctors of the church’ who is shown supporting a large black chair that is called the Cathedra Petri (Chair of Peter) in St. Peter’s Basilica in Vatican City. The late Joseph Tkach of the old Worldwide Church of God once referred to this chair as Satan’s throne (see Might Satan’s throne be the ‘Cathedra Petri’?). The improperly named Protestant publication Christianity Today once had a link titled, “Person of the Week: John Chrysostom” which went to an article titled: John Chrysostom Early church’s greatest preacher. So, Protestants too, endorse an anti-Semite. More on him can be found in the article John Chrysostom, Bishop of Constantinople and Antisemite. Leaders esteemed by the Eastern Orthodox, Roman Catholics, and Protestants have all advocated horrible antisemitism. Sadly, many in Europe and elsewhere still hold anti-Semitic views, and some take direct anti-Semitic actions. It is little wonder that many Jews are leaving, and others are considering leaving.